On June 30, 1998, the 33rd annual New York State Broadcasters executive conference presented their "Awards For Excellence In Broadcasting." "4 Stories" was named "Outstanding Public Affairs Series." For programming in the field of hunger and poverty, World Hunger Year's Harry Chapin Media Awards selected "4 Stories" in a second place tie with "60 Minutes" for the 1997 Best Broadcasts award. Also in the category, but finishing behind "4 Stories," were "Nightline" and NPR. The winner was Wisconsin Public Television. This was some of the best work I'd done yet. 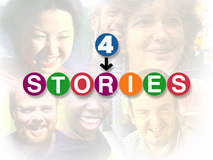 "4 Stories" was seen weekly, Saturday night at 7:30 PM on WNBC-TV. As Executive Producer and Director, I created and controlled every detail of production, and the result was enormously gratifying. The subject matter was a dream. "4 Stories" was a character-driven magazine focusing on local heroes, people who act selflessly to help others. Each episode contained three 5:00-6:00 minute segments, plus a follow up show-ender. While the show's budget was minimal from the outset, and was produced for a mere $28,000 per half-hour episode, "4 Stories" had all the polish, look, and storytelling of the best prime time news magazines. The series focused on volunteers, as well as organizations and groups, taking a pro-active role in helping their fellows in need. But "4 Stories" was neither preachy nor pious in tone. I approached subject matter, leads, tags and teases in a straightforward manner, selling the character and story line, not the high-mindedness of their work. "4 Stories" regularly beat powerful competing syndicated product: Baywatch (originals), X-Files (reruns) and Pensacola Gold (originals). But here's the key: Execution is everything. Idea selection, shoot-planning, scripting, and rough cut review were all critical to giving the audience a warm, compelling viewing experience. Brilliant, stylish, cutting-edge graphics were created by 4-Front from my ideas. The theme music gave the show a contemporary prime access drive. Music was executed under my direction by Rave. This was a research-driven series. I had a rule that no story could have appeared in a major print daily in the past three years. The same was true for TV coverage. I was aggressive in digging up original stories that would, and were, picked up by the dailies and the national press. The small staff consisted of approximately 8 free-lance segment producers, a writer, 2 researchers, 1 AP, and 2 PAs. Although we worked for Trans World International, a division of IMG, the company, and NBC, were exceptional in giving me total control over the series. I produced the shows alone (Brian Williams, a TWI executive, also took an executive producer credit, but was not involved in the production of the series), reporting to Irwin Weiner. I delivered my air masters to TWI and NBC simultaneously, without any prior review. This creative freedom was a key factor in the quality of the series. The series was hosted by WNBC-TV's Maurice DuBois. The most rewarding aspect of the series was the feedback our story subjects got. One organization we profiled, Dress for Success New York, provides free business clothes to women looking for their first jobs, coming out of prison, off welfare, and out of women's shelters. After our report, the organization received $40,000 in merchandise from Coach, a major feature article in the New York Times, and benefit parties thrown by the Motown Cafe resulting in $20,000 in contributions. And that's just one story. Ken Steele is a recovered schizophrenic who spent 30 years in mental institutions. His life was changed by a new medication, and he has emerged as a leading spokesman for the mentally ill. Ken also edits New York Voices, a newspaper for the mental health community. After our segment aired, he received well over 900 calls in 5 days, ranging from people seeking help, to people seeking to help. "4 Stories" made a difference. From an original idea by Irwin Weiner of Trans World International, the series deal was consummated by Dennis Swanson, then President of WNBC-TV, and Barry Frank, President of TWI. I was brought in as Executive Producer and Director in August 1997. While NBC-4 canceled the series after the first season to make way for a football preview show, its spirit will live on in the hearts of those it touched.